As usual, the Dutch hosted a wonderful International Friendship Regatta. The planning (including the weather) that went into this IFR was incredible! For newcomers, the I.F.R. (International Friendship Regatta) is a bi-annual event run by the Vega One Design Association, and hosted by one of the European Vega Clubs. This year it was Holland who were the hosts. What an event they produced. Racing on the Ijsselmeer with wind forces that varied from force 2 to force 6 over two days. Two interesting excursions, including a relaxing canal trip around the canals of old Amsterdam, a guided tour around the ancient city of Hoorn - Where the Dutch East India Company was founded, as was the Cape Horners Society. Cape Horn took it's name from this city, and all vessels passing from latitude 50�S to 50�S without stopping, west to east or viceversa and rounding Cape Horn, can become members of this very exclusive club. A Norwegian Vega had just done it this summer and could possibly be one of the smallest boats to be a 'Cape Horner' - if he had no stops whilst rounding the South American continent. VAGB can be proud of it's members. Seven boats sailed to Hoorn. 'Jenavive', 'Southern Comfort', 'Toria 2', 'Dizzy Daisy', 'Scandi.,' 'Bugle' and 'Rozema'. Three overseas members, Ross Dring, Lars Lemby and Arne Heinich crewed on English and Danish Vegas to the event. Sixty-eight boats came from nine different countries - Belgium and Switzerland being welcomed for the first time. Racing class was won by Ab Vis of Holland sailing 'Fint'. Cruising class, which had an enormous entry of 34 starters was won by Mr. Duursma sailing 'd'Halve Maen'. 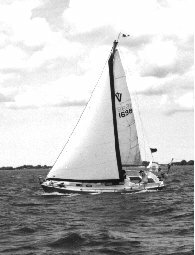 'Bugle', who has never been a racing machine, with her new jenny and first class crew of Lars Lemby and Ken Wakeling, came in with a respectable third overall. Her skipper is as incompetent as ever and all credit is due to her wonderful racing crew! In the last and best event, Britain's VAGB won in grand style. It was the 'Super dinghy race'. VAGB had two entries. 'The girl's boat' with Veronica Freeman, Julia Neesam and Diana Webb, presented themselves in their uniform of a dress made from a black plastic dustbin bag with the crest of Rochester City Council stamped on it, and the words 'for rubbish only' boldly written along the bottom. A couple of yellow Tesco bags covered the head, and armed with a boats mop and scrubbing brush for fending off and a frying pan and a couple of saucepans for rowing and attack, the girls were in business. 'The boy's boat' was a formidable sight. Steve Birch, John Vaughan and our chairman, Mike Freeman, displacing 50 stone between them, were the big guns! 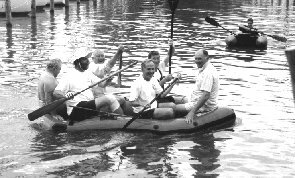 Mick Smith and Ross Dring were the light weight oarsmen, and Tom Sutton was the bowman. YES....six huge guys sat two abreast with one forward and one aft and came paddling to the start line chanting in unison, Polynesian style. They looked extremely daunting, and as there were no rules at all to this contest of rowing skills and speed, it was pretty obvious to the girls crew that they could be the object of attack and end up with a ducking. They were, however, half saved from a total overturn by the appearance of a very pretty young Dutch two girl crew, who were rowing for their lives. The British 'Water Buffaloes' took after them, having already boarded the girl's boat and drenched them thoroughly. En-route, they overturned all the other contestants, and whilst they were preoccupied by upsetting the pretty Dutch crew, the British girls, rowing and paddling with frying pan, slipped past. I heard a shout - "Get the girls!" - but alas, it was too late. The weight of the buffaloes had submerged their dinghy and it was now full of water and much too heavy to catch the flying girls. They were awarded a fine bottle of Gineva for their efforts, and were commended on their water resistant uniforms. But it was the boys boat and their antics that were the real winners in the hearts of the spectators. They had managed to change a 'serious' rowing event into a giant sporting spectacle of a rowing fiasco! The 18th International Friendship Rally was organised by the Kring van Vega Zeilers (the Dutch Vega Club) at Hoorn on the Isselmeer between the 17th and the 22nd July 2000. Over 60 Vegas from all over Europe attended and the crews were even more international. Dizzy Daisy, Toria II and Bugle from the Medway, Scandi and Jenavive from the East Coast and Southern Comfort with support from non Vega Rozema from the Solent made up the UK contingent, making us the second largest national grouping after our Dutch hosts. We included in our crews Lars Lemby from Sweden, Cai Christiansen from Denmark and Ross Dring from the USA. The International Friendship part of the rally was already well underway. Several of the boats met up in Ijmuiden, after some lively crossings, thankfully with following winds, and proceeded in company up to Amsterdam where we met others of our party. On the Sunday before the rally started we sailed to Hoorn and rendezvoused outside so we could enter the Yacht Club harbour together. When we arrived many of the host nation were already there and made us most welcome. Some wives had decided that Stena ferries are better than Vegas when it comes to North Sea crossings and joined us in Hoorn. The rally proper opened on the Monday with the Vega flag and the flags of all the participating nations being raised together. Old friendships, forged at previous rallies, were renewed and strengthened. New friendships were soon made. On Wednesday we started the racing, two races each for the Racing class of 8 boats and the cruising class of 34 boats. The wind was force four plus and some lively racing took place. The following day we raced twice again but this time in force three with lots of sunshine. The results show that Bugle did very well with a third place in the cruising class with the rest of us spread though the fleet. Considering how rarely the Vegas race in the UK it was an excellent result. The prize giving was held in the historic North Church at Hoorn and we were entertained by the Amsterdam Male Voice Choir. On the Friday the British contingent were major contributors to the Dinghy/Tender race. 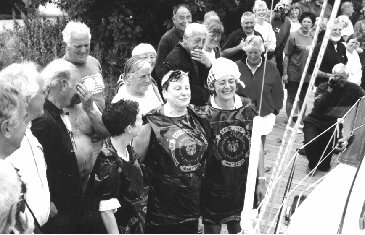 The ladies team of Di Webb, Veronica Freeman and Julie Neesam, looked most fetching in their Rochester Recycling dustbin liners as they tried, in vain, to stay dry. Unlike their male counterparts they actually won a prize, I think for the Concourse D�Elegance. The men�s team of Mike Freeman, Steve Birch, John Vaughan, Ross Dring, Tom Sutton and Mike Smith must have set a new record for weight carried in a nine-foot inflatable. At the start some one compared them to a Maori War Canoe, by the end of the course the resemblance was to a submarine. Noble efforts were made to scupper the opposition by all means possible if not legal. They did at least manage to drag several of the opposition into the water with them. The closing dinner was held in the Club House and speakers from the national associations paid tribute to the Dutch Club for its organisation and hospitality. The one recurring theme was the very real sense of friendship across all the nationalities and groups there. It was with some sadness that the rally broke up on Saturday, with many promises to meet again at the next rally in 2002 in Denmark. On the way home several of the British boats decided to head south through the Dutch Canal System, Scandi and Jenavive leaving by Stellendam for the East Coast, and Southern Comfort, Dizzy Daisy and Rozema heading for Vlissingen. Bugle and Toria II had already departed for Ijmuiden and the direct route home. At the VODA meeting, Denmark accepted the invitation to host the IFR in 2002. The Dutch club had put in an enormous effort to host a good event for the rest of us to enjoy, and enjoy it we did. It all flew by so quickly, and it seemed that we had hardly arrived before we were off again, homeward bound once more.